Metro projects are capital-intensive in nature, with a long construction period and traffic build-up requiring several years. “DMRC has almost completed construction of the third phase of expansion,” shares Anuj Dayal, Executive Director, Corporate Communications, Delhi Metro Rail Corporation. “In 2018-19, over 140 km of new lines have been opened. We have also received approval for the construction of three corridors under the proposed Phase 4 Delhi Metro.” He points out to land acquisition as the main challenge while executing mammoth infrastructure projects within city limits. Nagpur Metro has a total of 38 stations, and is divided into North-South and East-West corridors. To date, it has 141 elevators and 213 escalators. As Sunil Mathur, Director (Rolling Stock & Systems), Maharashtra Metro Rail Corporation, shares, the project had several challenges across various sections. For example, the foundation work needed utmost care while executing by the side of the existing Ram Jhula ROB foundation in such a manner that it did not disturb the soil strata adjoining the existing foundation. 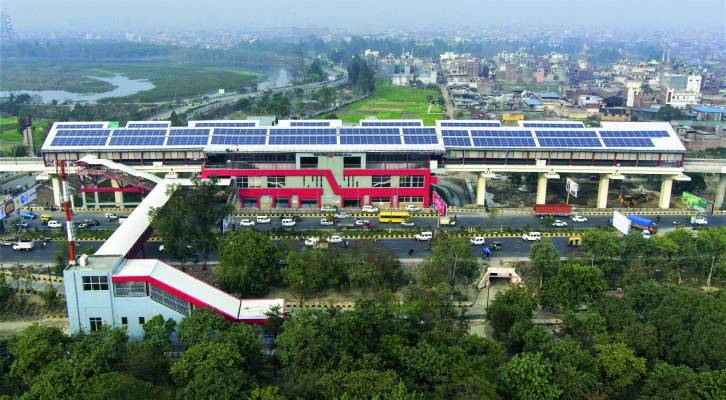 Further, the metro alignment near Sitabuldi interchange goes over railway lines, which necessitated the construction of a bridge over this section. One major challenge of Phase 1 was also the viaduct going from the airport to Sitabuldi metro station. This stretch included the 15-year-old Chhatrapati Flyover, which needed to be demolished with public support. However, all these were overcome with iconic construction engineering techniques and solutions (for details on the solutions adopted, log on to www.ConstructionWorld.in). As a major contributor to the metro-rail network in India, J Kumar Infraprojects is currently working on a total of nine projects across the Mumbai, Pune and Ahmedabad regions. “We work from foundation to superstructure, i.e. up-to-deck slab in case of elevated metro rail and construction of tunnel in case of underground works,” says Nalin Gupta, Managing Director, J Kumar Infraprojects. Commenting on Mumbai Metro Line 3, Arbind Kumar Rai, Senior Vice-President, CEC-ITD Cem-TPL JV, says, “The corridor is planned fully underground either on the edge of the existing road or along the median of the road.” With 41 per cent of work completed, he adds that major execution-related challenges included old buildings with no record of foundations, lack of space, the shifting of utilities, and logistics for excavation and concrete. That said, clearly, the metro revolution is on – and how!